I told you earlier I had the lust for an old car. Today I made arrangements to purchase a 1919 Model T Ford roadster all the way over on the coast in Fortuna, CA. Now I’ll have something to drive in the upcoming centenary of the Lincoln Highway (I’m sure there will be some celebrations somewhere). Also I can explore the back country nearby, once the snow stops and Spring arrives. It is a great post-Christmas present. 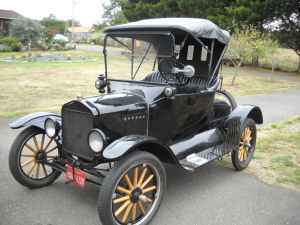 This entry was posted in Lincoln Highway, Model T Ford and tagged Lincoln Highway, Model T Ford, Travel. Bookmark the permalink.